While sitting in our camper through the torrential rain storms in Tofino, Tim started searching the internet for information on actual Surf Kayaks. He had heard bits and pieces about them over the years and was curious if they would make much of a difference for ocean surfing. Surf Kayaking is not really a prominent sport in North America and the 2 boat manufacturers are both based out of the UK. After much going round and round, we found a dealer for each in the US and emailed them about being able to demo their boats. 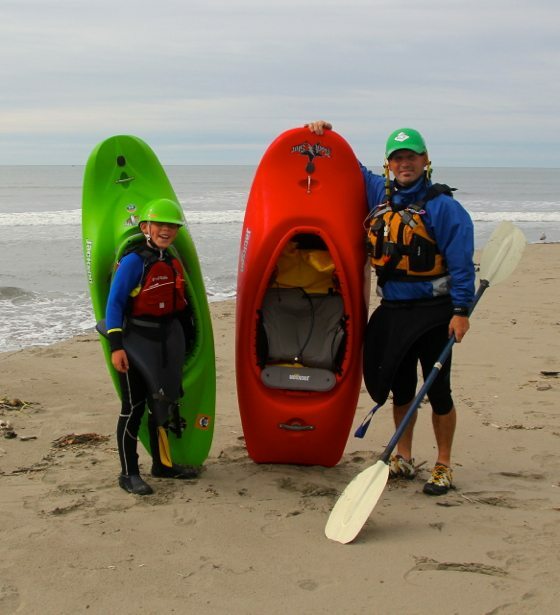 Much to our surprise, there was a Surf Kayak event in North Western Washington on October 5th and 6th and there would be lots of demo boats available. We quickly checked our schedule and determined that we could definitely make it there! Hobuck Beach is as far North West as you can get on the continental USA (outside of Alaska). It is on Makah Indian Land and is stunning. The location, the views, the scenery and the campground facilities are all well worth the trip. 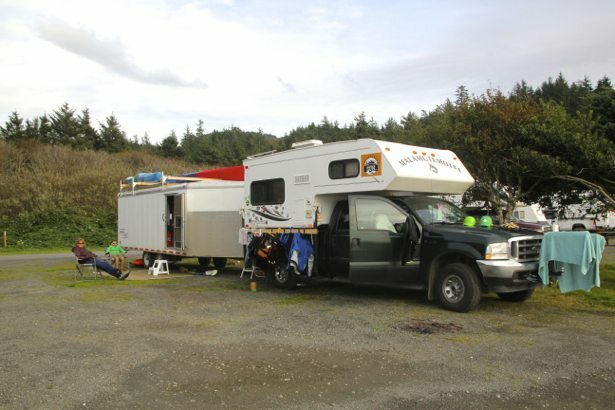 It is perfectly geared to surfers of all types and families with tent & RV camping along with great rental cabins. Showers (both outdoor gear and warm inside ones) are free and everything else is included for under $35.00 (for an RV site). We got there on a warm Friday afternoon and the boys immediately got dressed and launched themselves into the surf. The waves were just the right size for us to finally allow Hunter to try ocean kayak surfing and he was thrilled! After some brief tips and tricks, Hunter got the hang of things and was off surfing. I think there was a permanent smile on his face and it took some coaxing to get him out of the water. When he finally settled in to some lunch he announced that he wanted to participate in the competition the next day. We were both quite surprised as he’s not usually a competitive guy and opts out of most competitive situations. We happily wandered down the beach Friday night to meet up with everyone else associated with the event, to learn some more and to sign him up. The part that gave everyone pause for thought was the idea that we would have to get up at 7am to make it to the event meeting at 8am! (see next post for more details on the Hobuck Hoedown).